With PDF viewer component, it is easy for the developers to hide navigation Pane in Adobe Reader Programmatically. Is there any way to hide the adobe reader navigation pane programmatically? Yes, the component has the property "NavPanes". Simply set it as false before the developers call the LoadFrom method. If you haven't the pdf viewer component, you need to install the package firstly. With the activex control, you are not only able to view PDF documents, but also able to disable print, disable copy, disable edit and change the pdf window options. The control is lightweight and flexible, and gives developers new possibilities for using PDF in a custom solution. The developer can use the following code to show / hide adobe reader navigate panel in the Form_Load Event. .Filter = "PDF File Formats (*.pdf)|*.pdf|All Files (*. *) | *. * ||"
With the PDF viewer component, you are not only able to view PDF documents, but also able to disable print, disable copy, disable edit and change the pdf window options. 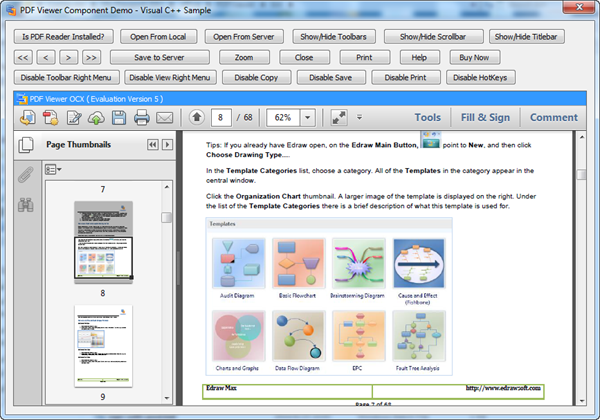 It allows developers to embed pdf files for in-place editing and viewing. It can be easily integrated into applications written in languages that support ActiveX control such as Visual C++, Microsoft Internet Explorer, Visual Basic, Delphi, WPF, C#, VB.NET, C++ Builder and Net languages.